Apple announced 7th generation iPod nano and iPod Touch along with the iPhone 5.The new iPod nano is thinner and lighter than the previous generation iPod nano, Apple has added key features like Bluetooth and FM radio. The new iPod touch is the thinnest iPod touch ever and has a 4-inch Retina display, a 5 megapixel iSight camera with 1080p HD video recording, Apple A5 chip, Siri and iOS 6. The new iPod nano has 2.5-inch multi-touch display. The new iPod nano also has new ‘Lightning’ dock connector. The new iPod nano will be available in 7 color options including Red, Green, Purple, Slate, Black, Yellow and Blue. The iPod nano will be available in a 16GB.Apple claims that the new iPod nano offers the longest music playback of any iPod nano for 30 hours, and also runs FM radio even longer. Apple also announced the new iPod Touch with new 4-inch Retina Display, a dual-core A5 processor, a 6.1mm thick and weight of just 88 grams, a 16:9 aspect ratio and a new 5-megapixel iSight camera comes with a backside illuminated sensor, a f/2.4 aperture, and a LED flash. The new iPod touch runs on iOS 6 and Apple claims that it gives 40 hours of music playback time. It supports Siri and also gets a 720p front facing Facetime camera. 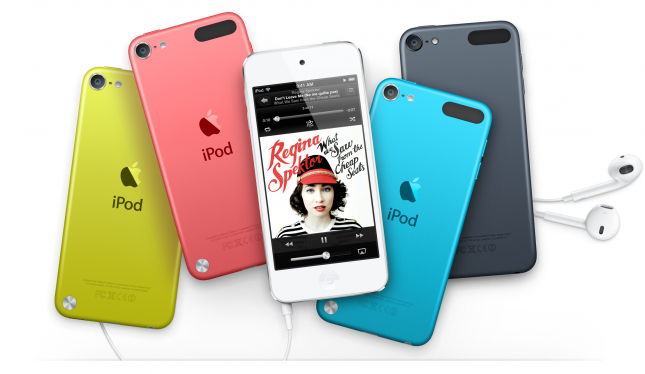 The new iPod touch will be available in five colors – Black, White, Cyan, Red and Yellow and available in two memory variants of 32GB and 64GB. Apple also ships the new EarPod earphones with the new iPod touch. The product will ship at a later date in October.